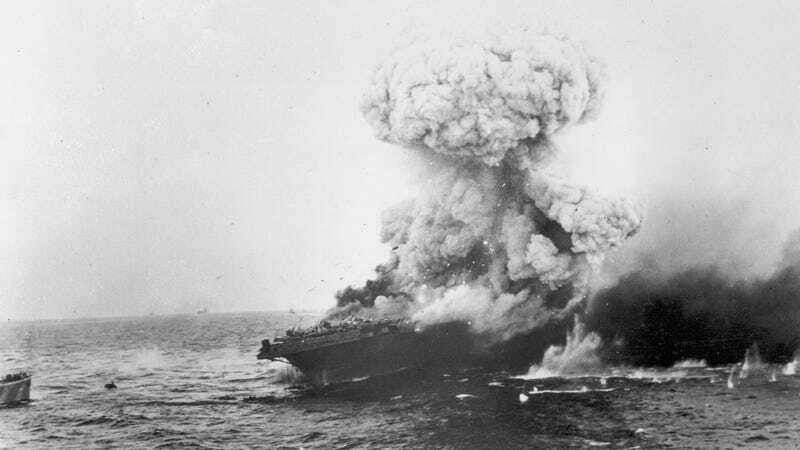 The USS Lexington explodes after being bombed by Japanese planes in the Battle of the Coral Sea in the South Pacific in June 1942, during World War II. The USS Lexington, a US aircraft carrier lost during the 1942 Battle of the Coral Sea, has been discovered by a team of civilian researchers off the north-east coast of Australia. The Lexington was discovered on Sunday, March 4, by Vulcan Inc., a company chaired by Microsoft cofounder Paul Allen. A search team aboard the Research Vessel (R/V) Petrel found the ship—one of the United States’ first aircraft carriers—about 500 miles (800 km) from the Australian east coast, and at a depth of two miles (3 km). The ship went down in May 1942 after a four-day battle against three Japanese aircraft carriers. Using a remotely operated sub, the Vulcan team was able to locate the ship’s nameplate, confirming its identity. The ship was found split up into three main pieces, its main section lying upright. The bow and stern section were found about a mile away. Photos of the wreck show the severed ship in exquisite detail, including some anti-aircraft cannons. To the west, the team found 11 of the 35 planes that went down with the ship, including seven Douglas TBD-1 Devastators, three Douglas SBD-3 Dauntlesses, and a lone Grumman F4F-3 Wildcat. These planes are in remarkably good shape, with the five-pointed star insignia of the US Army Air Forces clearly visible on the wings and fuselage. One plane was adorned with Felix the Cat and four miniature Imperial Japanese flags, indicating kills. The USS Lexington, or “Lady Lex,” as it was nicknamed, fought alongside another US aircraft carrier, the USS Yorktown, during the Battle of the Coral Sea, which lasted from May 4 to 8, 1942. Together, these ships fought three Japanese aircraft carriers, the Shōkaku, Zuikaku, and Shōhō, the latter of which went down during the battle. On May 8, the Lexington was badly damaged by torpedos and enemy planes, and the ship was deliberately sunk to prevent capture. Some 2,735 sailors were rescued, but 216 crewmen were killed during the battle. The engagement marked the first carrier-on-carrier battle in naval history, signifying a new type of naval warfare. The Lexington won’t be salvaged, as it’s protected under the US Sunken Military Craft Act, which designates it a war grave. The USS Lexington in 1941. A spokesperson for Vulcan said it had taken about six months of planning to locate the ship, and that it was a high priority target for the company. Last year, the company found the USS Indianapolis, which sunk in July 1945.